Sir Iain Richard Torrance, Kt, OStJ, TD, FRSE, born in 1949, he is a Church of Scotland minister, theologian and academic. Chaplain-in-Ordinary to Her Majesty Queen Elizabeth II in Scotland since 2001. He is a former Moderator of the General Assembly of the Church of Scotland. He is married to Morag Ann MacHugh, whom he met while they were students at the University of St Andrews, and they have a son, Hew, and a daughter, Robyn. Torrance was born in Aberdeen, Scotland. He is the second and younger son of the Very Rev. Thomas Forsyth Torrance, MBE, also sometime Moderator of the General Assembly of the Church of Scotland. He was educated at the Edinburgh Academy and at Monkton Combe School, Bath England, then graduated with an MA from the University of Edinburgh, a BD from the University of St. Andrews, and a DPhil from Oriel College, Oxford. In 2016 Professor Torrance was granted Supporters on a compartment by Lord Lyon Rev. 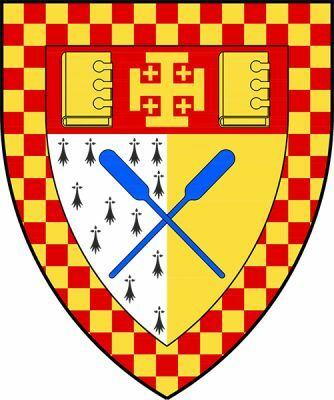 Dr. Joseph Morrow, CBE, something usually only granted to peers and Knights Grand Cross, but the Lord Lyon has the discretion to award supporters to persons of distinction. The Grant was presented to Professor Torrance in March 2016 by the Lord Lyon. The award recognizes Professor Torrance's eminent service to academia, the Church of Scotland, and the Crown in Scotland. The two supporters are dachshunds Maud and Cassiopea, who were often spotted in and around Princeton Theological Seminary when he was President there. The Prime Minister of the United Kingdom, Theresa May, requested Queen Elizabeth II honour Professor Torrance as a Knight Bachelor (Kt.) for services to higher Education and Theology which the Queen did in the 2018 New Years Honours. Information sourced from various internet and other sources and adapted by your editor for use here.